James II of England/VII of Scotland (14 October 1633-16 September 1701) became King of Scots, King of England, and King of Ireland on 6 February 1685, and Duke of Normandy on 31 December 1660. He was the last Roman Catholic king of Scotland, England, or Ireland. Some of his citizens did not like his religious ideas, leading a group of them to disobey and fight against him. This was called the Glorious Revolution because no one was killed. He was not replaced by his Roman Catholic son, James Francis Edward, but by his Protestant daughter and son-in-law, Mary II and William III (William II of Scotland), who became rulers in 1689. The belief that James, not William III or Mary II, was the one true ruler became known as Jacobitism (from Jacobus or Iacobus, Latin for James). James made one serious attempt to recover his throne when he landed in Ireland in 1689. 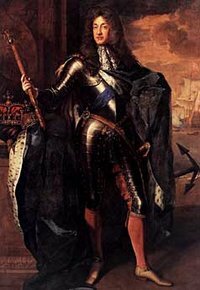 After his defeat at the Battle of the Boyne in the summer of 1690, he returned to France, living the rest of his life under the protection of King Louis XIV. His son James Francis Edward Stuart (The Old Pretender) and his grandson Charles Edward Stuart (The Young Pretender and Bonnie Prince Charlie) attempted to restore the Jacobite line after James's death, but failed. The issue listed are the children of James II who survived into adulthood. Illegitimate are not listed. Mary II of England 30 April 1662 28 December 1694 Married William III of England (1650 - 1702) in 1677. No surviving issue. Anne of Great Britain 6 February 1665 1 August 1714 Married George of Denmark (2 April 1653 – 28 October 1708) in 1683. James Francis Edward Stuart 10 June 1688 1 January 1766 had issue[source?]. ↑ In Scotland, he was called James VII, as there were six previous kings of that nation named James. This page was last changed on 5 October 2018, at 07:42.